Both real gold as you’ll see. What could those numbers be? 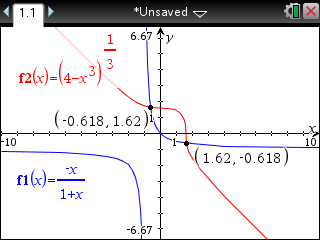 x = (1 ± √5)/2, y = (1 ± √5)/2. "What a great starter puzzle this is. It revises so many concepts for IB students (Standard and Studies). This is how it went in my class today: The mission is to find the gold, it is in the labyrinth (of your mind!). The first obstacle is to know what kind of Maths topic this is: algebra? OK what kind of algebra is it? Simultaneous equations? Very good, can you write down those simultaneous equations? Can you solve those simultaneous equations? The simultaneous equation solver on the calculator is no good as it only solves for linear equations. How about drawing graphs and seeing where the graphs intersect? You will need to know how to rearrange the equations to make y the subject. Wow, what a surprising answer!"